Promote Unlimited Websites & Lead Generation With A Single Link! What you're going to get? Make immediate changes and start sending traffic to whatever web page you want. 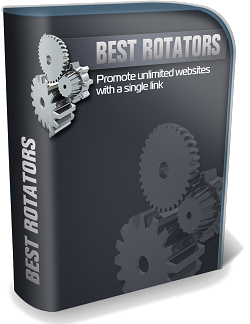 Just add / delete / modify your links to your rotator when you want without changing any advertising or links in your blog / websites / email autoresponder / ads out there. Test two or more sites - as many as you want. Rotating each site in sequence so they get the same amount of traffic and see which site performs better in sales or subscribers. You put all the co-op members websites in the rotator and each member gets the same number of visitors. When you have affiliate links or website links that stop to exist or pointing to products that are outdated in your blog posts (and that you didnt even know where they are), or inside a ebook / PDF file, you dont need to search every single link and change it in those places. Just go to your rotator and change the link at any time and the changes take place immediately. You Can Have ONE Capture Page, And Have The Rotator Inside The Capture Page Form. This Way Every Single person In Your Co-op Will Receive Exactly The Same Amount Of Leads For Each Share In The Co-op. Rotate an unlimited number of links. Set a rotator URL weight, to display a URL a certain number of times before moving to the next URL. Ability to Disable / enable URL as necessary. Set a maximum number of hits to be delivered to a URL. Track the number of hits to any of your URL's. Admin login panel for rotator security. Easy to use Admin are for manage your links and rotators. New Member | Already a VMP Member? Already a VMP Member? Login below | Already registered?New Member?